Do I have To Extract My Wisdom Teeth? This is a common question that we get asked at Modern Smiles. Although there is no set rule, the accepted and standard of care is to remove these teeth at an early age. However, many people are skeptical about removing teeth that don’t hurt or otherwise are not even aware that they have. Generally, it is not necessary to remove your wisdom teeth if they are properly positioned in your mouth, are not causing any problems, and you have excellent oral hygiene. However, wisdom teeth are the farthest teeth in the mouth and are very hard to properly maintain and keep clean. They are an evolutionary useless body part, similar to tonsils or the appendix. Due to their position, wisdom teeth, also known as 3rd molars, are often neglected because of inaccessibility and difficulty to properly floss and brush. Therefore, these teeth are at much higher risk of developing decay and become a common spots for accumulation of bacteria and pathogens. So, if that’s the case, why not just wait till they go bad and then pull them out like other teeth? The answer to that question is tied to our philosophy of practicing preventive dentistry. Modern day standard practice is not longer to wait for something to break down to fix it, cause by then it will often be a very costly and difficult procedure, but rather a proactive approach to diagnosis. Preventive dentistry is about identifying potential problems and resolving them before they develop into one and at Modern Smiles Dental Office in North Hollywood, our focus is using latest diagnostic technologies to accomplish this. Consider this x-ray of a patient with wisdom teeth that were kept in. 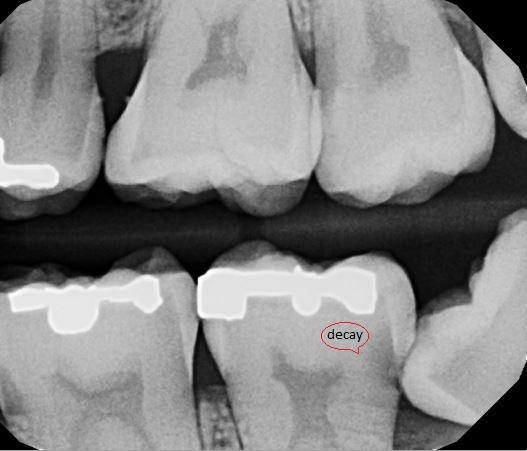 As you can probably see, the tilted lower wisdom tooth has caused a break in the outer shell of the neighboring tooth in front of it and an extensive decay has formed inside of that tooth. This patient is now experiencing dental pain and unfortunately will have to undergo a root canal treatment with a crown in addition to removal of the wisdom tooth. 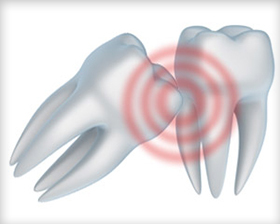 This could have been prevented years ago if the wisdom tooth had been removed preemptively. This list is not comprehensive so it’s important to talk with your dentist in detail about your health and treatment options. At Modern Smiles we are committed to providing customized care to each of our patients and our expert dentists will assess your personal situation and figure out what will be necessary for you. Call us today at (818) 763-9353 or schedule an appointment online.